The total global aerosol production is presently estimated to be between 2-3x109 tonnes per annum, and on any given day perhaps as many as 1x107 tonnes of solid particulate matter is suspended in the atmosphere (Bach 1979; Cunningham and Saigo 1992; Ahrens 1993). Under normal circumstances, almost all of the total weight of particulate matter is concentrated in the lower 2 km of the atmosphere in a latitudinal zone between 30°N and 60°N (Fennelly 1981). The mean residence time for aerosols in the lower troposphere is between 5 and 9 days, which is sufficiently short that the air can be cleansed in a few days once emissions have stopped (Williamson 1973). The equivalent time in the upper troposphere is about one month, and in the stratosphere the residence time increases to two to three years (Williamson 1973). As a result, anything added to the upper troposphere or stratosphere will remain in circulation for a longer time, and its potential environmental impact will increase. content—perhaps as much as 90 per cent (Bach 1979)—is natural in origin, although anthropogenic sources may be dominant locally, as they are in urban areas, for example (see Figure 5.2). Dust particles created during volcanic activity, or carried into the troposphere during dust storms, are examples of common natural aerosols. Dust blown eastwards from the Gobi Desert and adjacent arid lands of northern China is a significant constituent of the atmosphere in Beijing in April and May. Less frequent storms can also have local significance. A major dust storm in Australia in the summer of 1983 carried dust as high as 3.6 km into the atmosphere and deposited 106 kg of dust per hectare over the city of Melbourne (Lourensz and Abe 1983). That dust was picked up from the desiccated wheat fields and overgrazed pastures of Victoria and New South Wales, and farming practices, along with quarrying and a variety of industrial processes make an important contribution to dust of anthropogenic origin (Williamson 1973). Natural particles of organic origin—such as the terpenes considered responsible for the haze common over such areas as the Blue Mountains of Virginia—join hydrocarbon emissions from human activities to provide an important group of organic aerosols. Total organic emissions in the world have been estimated at as much as 4.4x108 tonnes per annum (Fennelly 1981). Bolle et al. 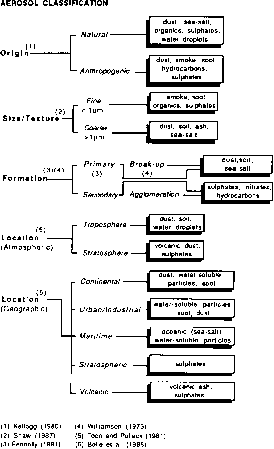 (1986) have grouped aerosols into several mixtures, which include combinations of the different particle types (see Figure 5.1). Three of these are geographically based. In the continental mixture, dust-like particles of natural origin predominate (70 per cent of the total), and most of these are confined to the troposphere. 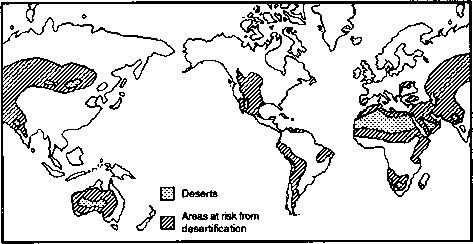 They may be carried over considerable distance, however; dust from the Sahara and Sahel regions of Africa has been carried on the tropical easterlies to the Caribbean (Morales 1986). Logically, volcanically produced aerosols could be included in the continental mixture, but, perhaps because of the major contribution of volcanic eruptions to aerosol loading, volcanic ash has been included as a separate item in the classification. In the urban/industrial mix, water soluble aerosols make up more than 60 per cent of the total. They are of anthropogenic origin, and include a high proportion of sulphates. Soot and water vapour are other important products of urban and industrial activities, but mechanically produced dust particles are of relatively minor importance. The effects of individual urban/industrial aerosols may be enhanced by combination with other constituents of the atmosphere. Chemical particles—soot and fine dust, for example—may act as condensation nuclei for the water vapour, and the net result is to increase cloudiness in urban/industrial areas. Aerosols of urban and industrial origin are normally considered to be restricted in their distribution, since they are mainly released into the lower troposphere. However, products of urban combustion found in the Arctic and the increasing levels of sulphates in the stratosphere, suggest that their effects now extend beyond the local area (Shaw 1980). The third geographically based aerosol mixture recognized by Bolle et al. (1986) is maritime in origin. It includes water and sea-spray particles for the most part, with only a small proportion of water-soluble particles (c. 5 per cent). main mass of particulates is concentrated in two peaks, one between 0.01 micrometre (pm) and 1 pm, centred at 0.1 pm and the other between 1 pm and 100 pm (see Figure 5.3), centred at 10 pm (Shaw 1987). The smaller particles in the first group are called secondary aerosols since they result from chemical and physical processes which take place in the atmosphere. They include aggregates of gaseous molecules, water droplets and chemical products such as sulphates, hydrocarbons and nitrates. As much as 64 per cent of total global aerosols are secondary particulates, 8 per cent of them anthropogenic in origin from combustion systems, vehicle emissions and industrial processes. The other 56 per cent are from natural sources such as volcanoes, the oceans and a wide range of organic processes (Fennelly 1981). Some estimates suggest that sulphate particles are now the largest group of atmospheric aerosols, accounting for as much as 50 per cent of all secondary particles (Toon and Pollack 1981). Most of the tropospheric sulphates are of anthropogenic origin, and contribute to the problems of acid rain (see Chapter 4) whereas those found in the stratosphere are most likely to be the products of volcanic eruptions. The larger particles with diameters between 1 and 100 pm are called primary aerosols, and include soil, dust and solid industrial emissions, usually formed by the physical breakup of material at the earth's surface (Fennelly 1981). There is some evidence that these groupings are a direct result of the processes by which the aerosols are formed. Mechanical processes are unable to break substances into pieces smaller than 1 pm in diameter, whereas the growth of secondary particles appears to cease as diameters approach 1 pm. (Shaw 1987).